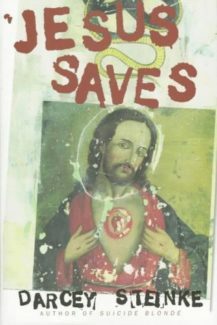 The topic of Jesus Saves is damnation – the desiccation of forgotten suburban sprawl receding into a backwash of strip-mall lots isolated save for swirling eddies of garbage and the forgotten, disillusioned young. In this landscape, the fates of two girls collide. Ginger, the rebellious teenage daughter of a beleaguered minister and Sandy Patrick, a young child, kidnapped and tortured by an unnamed molester. As Sandy’s torture and abuse leads her further into an imaginary world of double-edge meaning and ironic animal characters, Ginger follows the case of the missing girl as though looking for a sign. While Ginger’s father still clings to God, although his congregation has long since wanted someone hipper – someone far more entertaining – she sees only emptiness. She just watched her mother die of cancer, cursing God and her father. 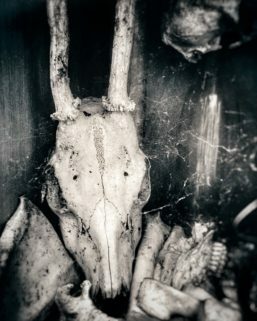 Her boyfriend is obsessed with death, his recreation post suicide attempt being the semi-Satanic shrine in the dump, topped by the dismembered head of a deer he ran down. And here is Ginger, between two worlds in a land of floating jetsam, looking for hope or a reason to completely disintegrate. The title’s irony is double – this is a broken, unmerciful world, the underbelly of everyday life and the predictor of nameless, ceaseless violence, and one that ironically ends in a sort of salvation at the sacrifice of another. Death, in its way, has a certain beauty here. 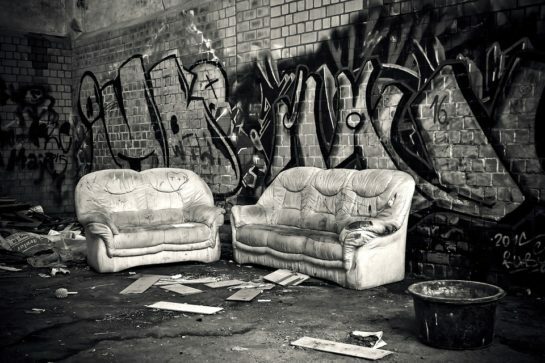 This world Steine creates make us want to take a shower, escape the endless flow of Burger Kings and late night neon flashes, the faded homes and trampled carpets of lives lived yet somehow already stale and decayed. It’s a weird voice, one that is inescapably beautiful in its relentless, lyrical description of everything ugly. It’s a slow story, a sad one, one devoid of hope and yet intensely layered with meaning (most of it not positive, admittedly.) In the end, it’s bella bruta – a beautiful ugly. Despite the title and what you may think going in, this is a horror story, plain and simple. What makes it especially chilling is how viable it is. The world is full of stories such as Sandy Patrick’s, full of villains like the man who has abducted her (called The Troll). Likewise, there is a Ginger in all of us, floating somewhere in the sea of sordid meaning looking to either escape or drown but not really believing enough in either to just choose. Ginger’s father, the preacher who still believes, who still really cares despite his own trauma, is replaced not for his faith, but for his lack of showmanship – that which should matter least. Because of all this, and the somehow enchanting lyricism of the writing that just won’t let us look away, let us stop seeing this depression, this horrible side of humanity that is so very close to the surface of life, Jesus Saves is a trip straight into depression. Yet, we can’t put it down and we can’t un-see, un-hear any of it. It’s a warning, a there-but-for-the-grace-of-God-go-I narrative transformed into the ultimate question: why do bad things happen? Needless to say, Jesus Saves is graphic, Sandy’s portions being violent and disturbing as she is repeatedly molested and tormented by a man who is himself more than half mad. The most vivid moments in the book, those layered with so much metaphor and meaning, are Sandy’s hallucinations. Still a child, she parses her understanding through animated characters and this is the most heartbreaking way possible to capture her degraded innocence morphing into an unerring understanding. As she drifts closer to death, the animal’s speeches take on doubled and tripled meanings with the final, gut punch of the novel: “. . . of course, what else did you expect.” This then is a book dedicated to extreme ugliness. It goes where we are afraid to go. It says what we secretly suspect but are afraid to accept. It uses the gorgeousness of language to feed us this vicious warning, take this snapshot of doubt and fear and finally, move on. Some reviewers say in the end that Sandy is the figure of Jesus, her sacrifice something that despite its gruesomeness brings forth some good fruit. I don’t see it, personally. To me, it’s the ultimate book about aloneness in an evil world and while my worldview doesn’t stretch to such utter oblivion, there is something about the way Steine captures the feeling, the essence of doubt and despair, that resonates in an almost comforting way – an acknowledgement, a confession. Yes, we’ve all felt it and here our darkness is validated, our deepest most personal lack of faith in everything – God, life, our fellow humans, ourselves, starkly revealed. In a way, it’s edifying to look the darkness in the face and give this feeling, this horror, a name, a certain universality. But in the end, you’re glad it’s not your story, not a stage where you are stuck enacting the hopeless roles of characters that, while some are still living, have a very long way to go toward redemption and the light. They probably won’t even reach it, but really, what else did you expect?